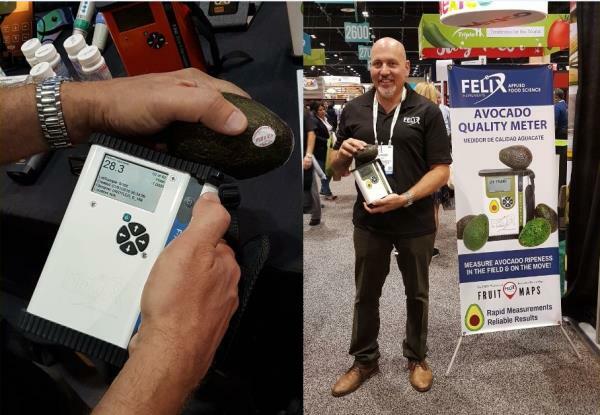 The traditional way to measure avocado dry matter requires up to 48 hours and now with Felix Instruments growers can measure it only in 12 seconds. Instant access to dry matter measurements is improving handling throughout the distribution chain. Leonard Felix, the owner and president of Felix Instruments – Applied Food Science, shared with us why dry matter is important and how to know when it is the right time to pick your fruits. Dry matter is everything in the fruit minus the water. This includes sugars, cell wall, proteins and starch. As the fruit grows and matures it accumulates dry matter in a consistent way. “If you harvest immature fruit when the dry matter is to low it will never ripen, if dry matter is barely low even if fruit ripens it won’t taste good. If dry matter is high, after you ripen fruit, it will be nice, oily and delicious”, - explains Leonard Felix and shows recently introduced Avocado Quality Meter. He adds: “To measure dry matter in traditional way you will have to cut the fruit, weight it, dry it, and then weight it again. It takes 48 hours in a regular oven or several hours in a microwave. And we are able to do in 12 seconds only without cutting the fruit”. The new Avocado Quality Meter is based on the original F-750 Produce Quality Meter. It is engineered to gauge the maturity of avocados via dry-matter assessment. Leonard takes avocado in one hand and Avocado Quality Meter in other hand pushes the button and instrument predicts percent dry matter. “It's just that simple. The same could be done on the tree. No need to pick or cut part of your crop”, - comments Mr. Felix. The Avocado Quality Meter can use a Wi-Fi connection and all the data can be transferred to a computer or the internet for easy analysis and data sharing. Benefits of the Avocado Quality Meter include a more in-depth avocado model for measuring dry matter, as well as a significantly smaller price tag than the F-750 Produce Quality Meter. The Avocado Quality Meter also comes with the ability to use Fruit Maps, the free interactive harvest map application co-created by Felix Instruments and Central Queensland University. Before the end of the year Leonard Felix plans to have a similarly simple and less expensive Mango Quality Meter which will instantly report Dry Matter and Brix. Felix Instruments – Applied Food Science was founded in 2012 as a subsidiary of CID Bio-Science, Inc., which has been designing instruments for agricultural and environmental research for over 25 years. Focusing on pre- and postharvest applications, Felix Instruments helps fresh market professionals maximize the value of their products with portable Gas Analyzers and NIR Produce Quality Meter.